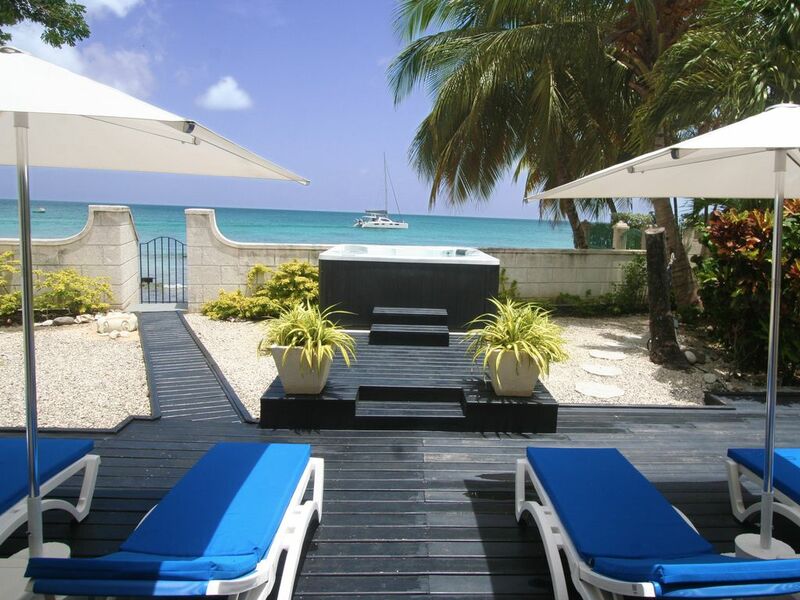 Single level beach front villa between Holetown and the famous Mullins Beach. Camden Nook is a delightful villa with direct beach access and an outdoor jacuzzi tub overlooking the Caribbean sea. The villa comprises of three double bedrooms all with air conditioning. Celia is a world renowned interior designer and tv personality. Together with her family they fell in love with the island of Barbados in the early 2000's. We have a great love affair with the island and it is the first place we all loved to be together, with its great climate, restaurants and beaches. A three double bedroom beachfront villa located on a beautiful quiet, sandy beach in St James on the Platinum coast of Barbados. The villa is equipped with a lovely sundeck with sun beds and an outside jacuzzi tub overlooking the turquoise sea, great for a sundowner. The Caribbean sea is generally calm and warm and suitable for swimming, snorkelling and fishing . The villa is a short drive either South to Holetown, offering fantastic shopping, bars and restaurants in the up-market Lime Grove development, and North to Speightstown which boasts a more rustic, local vibe, full of buzzing restaurants and bars. The Lone Star, one of the owner's favourite restaurants is a 15 minute walk from the villa along the beach (if you don’t mind getting a little wet!) or a 1 minute drive. There you can enjoy the view from the lovely cocktail bar, or lunch and dinner dining on the beachfront. The villa manager can happily arrange your very own watersports from the house, or a trip on a catamaran. Alternatively you can take a 5 minute drive to the famous Mullins Beach, with it's restaurant/beach bar and water-sports facilities. The house is directly on an uncrowded stretch of beach. We have our own private access with steps onto the sand allowing for easy access. The villa is situated directly on the beach at Weston, St James. Directly outside the villa is a small reef, ideal for snorkelling, surrounded by smooth, sandy beaches. The villa is directly on the beach with its own private gated entrance. Skippered boats are available locally from Mullins beach as well as ski boats, jet skis etc. There are several world class golf courses very near to the house. Royal Westmorland is in the hills directly above the house and Sandy Lane is only 15 minutes away to the south. Newly added to the villa is a plunge pool spa. The plunge pool looks over the sea and is a great place to cool off whilst relaxing at the house or for the children to play in. Beachfront Villa on a beautiful quiet sandy beach (camdennook.com). Warm turquoise water, great for swimming, snorkelling, fishing . Camden Nook is situated a short drive either from Holetown with it's upmarket shopping, restaurants and bars in Lime Grove or Speightstown for a more rustic experience of local bars and restaurants and the famous Nikki Beach Club. 5 minutes to the North is Gibbs Beach and the famous Mullins Beach with its beach bar/restaurant and water-sports facilities. 3 min drive or a 15 min beach walk, (you may get a little wet!) from the villa is the Lone Star Restaurant which has a great cocktail bar and beachfront dining. If you prefer something a little more Bajan; the John Moore Rum Bar (one of the Barbados presidents watering holes) is walking distance. Here you mix with the locals playing dominos and enjoy a cold drink on the beach.